While many local councils and highways departments have done an excellent job in making shopping centres easily accessible to disabled people, there are still many physical and social areas that could do with radical improvements if the requirements of the Disability Discrimination Act (1995) are to be met in full. From 2004, the providers of goods, facilities, and services, will all have to take reasonable steps to remove physical features which make it impossible for disabled people to access said goods facilities and services. 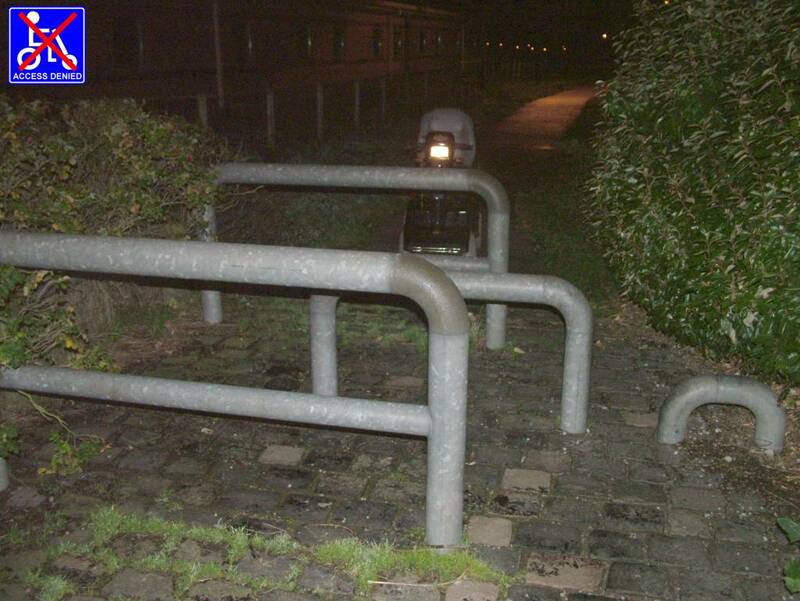 Such features typically include not only still un-dropped kerbs in out of town areas, but also the tradidtional "Kissing Gates" often found on country walks - plus their more modern steel equivalents which (in theory at least) are designed specifically to prevent access to recreational areas by motor cyclists. While such features seldom do actually prevent access by healthy and determined young motor cyclists (who simply ride straight over them or hump their machines around them) they do present major and often insurmountable obstacles to perfectly legal Class II and Class III invalid carriages (typically electric "mobility" scooters - to you and I) which lack both the power and manouverability of off-road motor cycles, and, (which by nature of their intended purpose) cannot be so readily "humped around abstacles" by their riders. the access-denied campaign contends that all the obstacles presented here are now illegally denying access to goods, facilities, or services to disabled people through the use of physical barriers - all of which goods, facilities and services are instantly and easily accessed by able bodied people. Typical examples of places where equal access is still being denied to phsically disabled people. 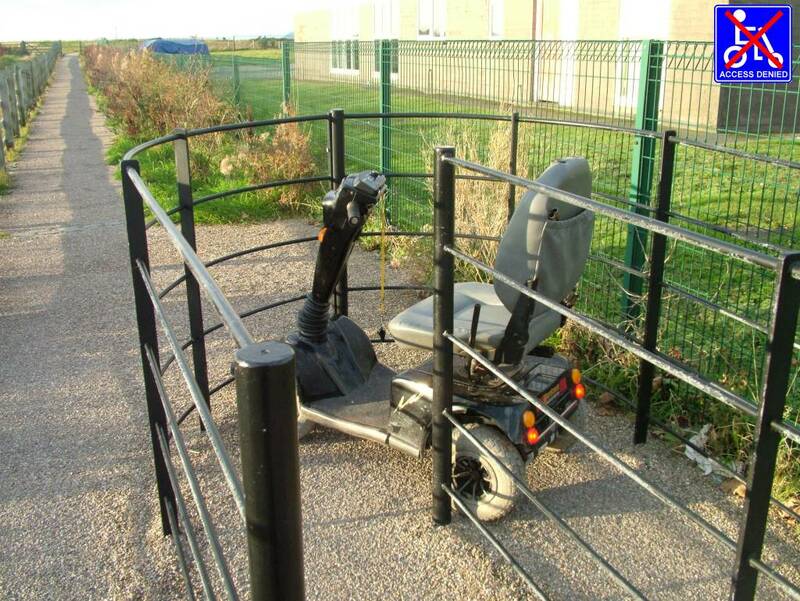 Is it really illegal to prevent access by disabled people in this way? Duty of providers of services to make adjustments. 21. - (1) Where a provider of services has a practice, policy or procedure which makes it impossible or unreasonably difficult for disabled persons to make use of a service which he provides, or is prepared to provide, to other members of the public, it is his duty to take such steps as it is reasonable, in all the circumstances of the case, for him to have to take in order to change that practice, policy or procedure so that it no longer has that effect. (d) provide a reasonable alternative method of making the service in question available to disabled persons. So yes... it really is illegal to continue to discriminate against disabled by denying them access to facilities readily available to able bodied people. Service providers have already had 9 full years to prepare themselves for compliance (the Disability Discrimination Act was passed in 1995) and the full weight of the act is now in force. Any organisation or business which continues to disadvantage disabled people is breaking the law and are hereby put on notice that they will be made accountable. Yes. It is very much up to disabled people - their carers and supporters - to publicise instances where the Disability Discrimination Act is still not being complied with. the vast majority of organisations and businesses are not in any way malicious, and often respond positively once problems are brought to their attention. It is not in the interests of disabled people to alienate the able-bodied world with trivial high-cost court actions when simply supplying the relevant information might well achieve a more amicable outcome. Able bodied people have never lived in a disabled person's world and often have no idea of the impact of their decisions. the aim of this campaign is primarily to inform those in authority of the ways in which disabled people are still being discriminated against, and to encourage them to find simple and cost effective solutions. If you would like to support the rights of disabled people to access the goods facilities and services still denied to them there are several options open to you within the bounds of our modest campaign. 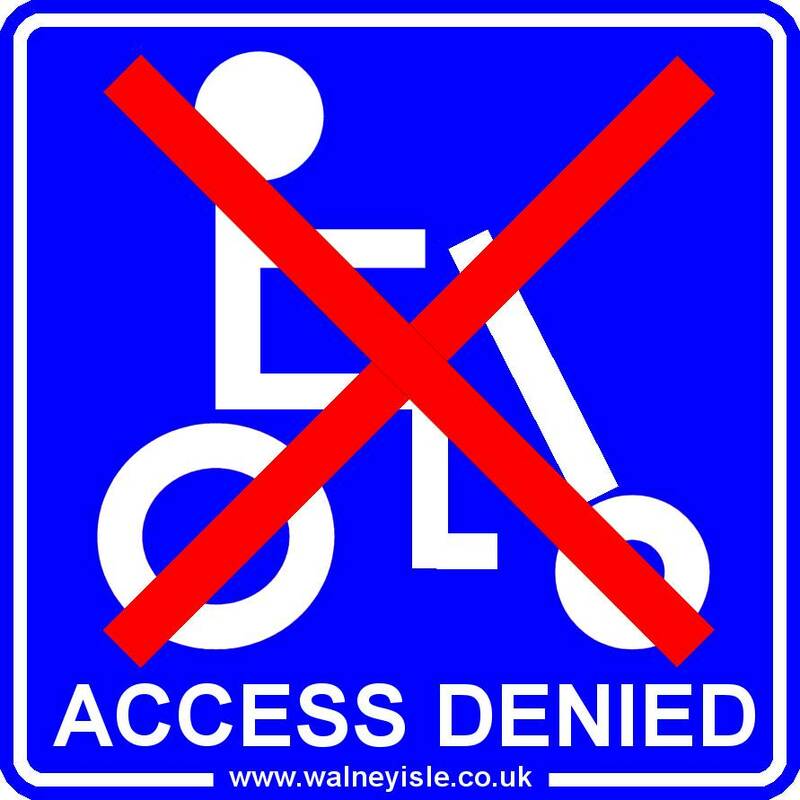 Use our "Access Denied" thumbnail image to link your web site to ours so that your web site visitors have the opportunity to inform themselves regarding the worth of our campaign. Have some small self-adhesive waterproof stickers made from the full sized version of our "Access Denied" image (you may use the image without restriction) and carry a few with you at all times ready to be attached as warning/informational signs at the start of any footpath which is obstructed by a physical barrier which an invlid carriage would find insurmountable. Write an open letter to your local newspaper, radio or TV station, asking why specific physical barriers which prevent access to any class of invalid carriage are still in place and what can be done about it. the Disability Discrimination Act is reasonably hot news at the moment and publicly questioning why discrimination still occurs unchallanged can only help our cause. Start you own local campaign and keep in touch with ours so that we can present a united front to the media. You may use any/all of the text/images on this page as a starting point, specifically - you may freely produce and distribute as many copies of our Access Denied poster/sticker as you wish. Barrow in Furness and the immediate area only please... use the "Feedback" link at the bottom of this page to send me a message identifying the nature and exact location of a physical barrier. the information will be displayed on this web site, and the relevant organisation will be contacted and notified that yet another local (who wishes to remain anonymous - should you so desire) has requested that they be informed of a potential breach of the DDA. I will endevour to visit local barriers in person and obtain a photograph to accompany your comments. 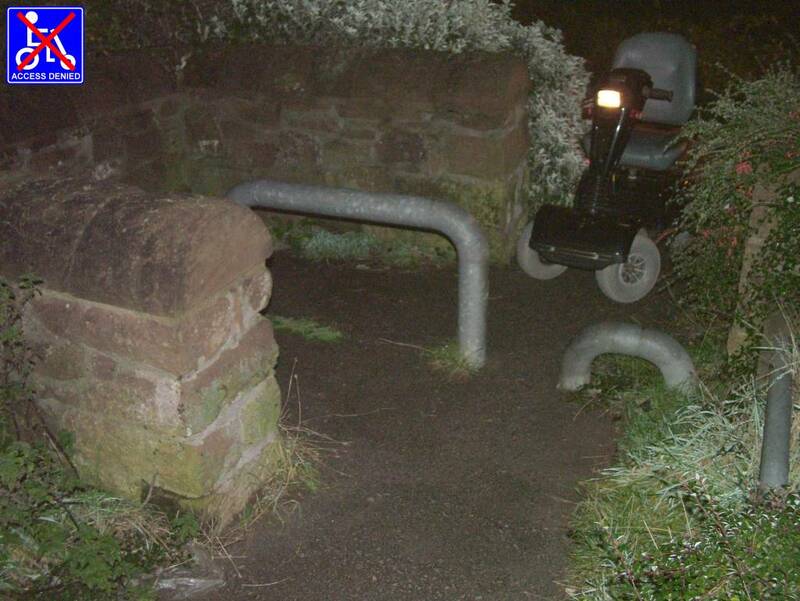 Once having identified a physical barrier anywhere else in the country - photograph it (preferably with an invalid carriage in the picture positioned in such a way that it highlights the specific problem) and send it to us for display on our web site... or (and even better)... send it to us AND to your local newspaper, AND the organisation responsible for errecting the barrier in the first place. 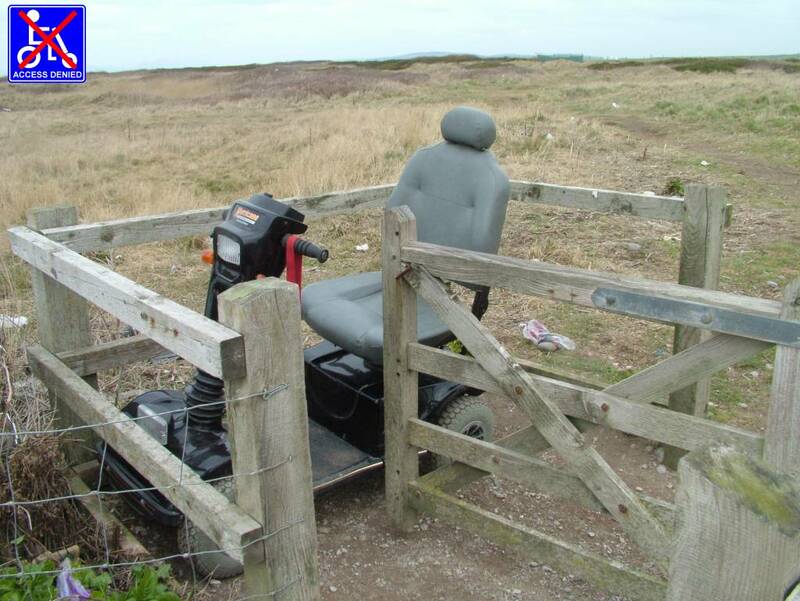 Only through disabled people and their supporters making a fuss will the authorities realise that disabled people too would like to gain access to the same outdoor activities as everyone else.